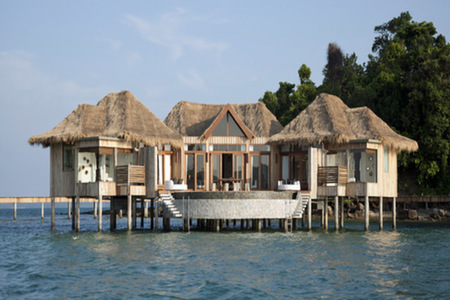 Stunning villas and top notch service is the name of the game on this exclusive all-inclusive private island off Cambodia's south coast. 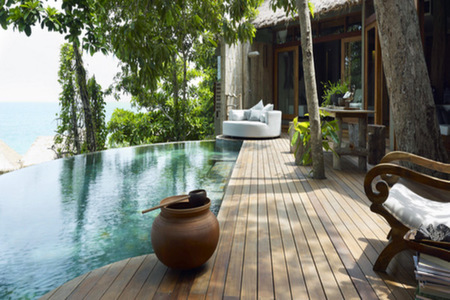 All villas have a private deck and plunge pool at this idyllic resort. From the moment you board the speedboat on the south coast near Sihanoukville to your first glimpse of the island some 30 minutes later, you know you are in for a special stay. Picture crystal clear water, fine white sand and natural-looking bungalows on stilts over the water - it's how you imagine Thailand looked 30 years ago. General manager Ruth and her colleagues are likely to be on the jetty welcoming you to Paradise with a delicious refreshing drink made from the natural ingredients of the island. That's just the beginning. In short, the island offers everything one might imagine a private island to be. From the stunning coast line to the huge, beautiful villas, infinity pools, delicious food and attention to detail; it scores top marks on all levels. 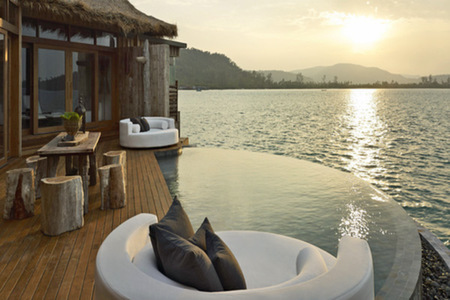 The resort, which opened in 2012, is spread over two islands near Koh Rong. It was founded by Australian team Rory and Melita Hunter, who discovered it by accident when exploring and instantly fell in love. They have worked hard to preserve the environment and also run a charitable foundation that supports those on the nearby island of Koh Rong. 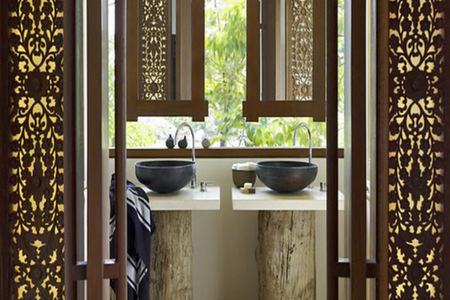 The accommodation celebrates the almost impossible achievement of extending the natural beauty of the island indoors. Huge beautiful pieces of driftwood provide the flower planters, lamps are made form reclaimed oil barrels found in the sea, and even the artistic images of the water were taken by Rory himself. From the personalised hand-written notes on scrolls, to the stunning bathroom with huge floor to ceiling windows, the villas are nothing short of magical. 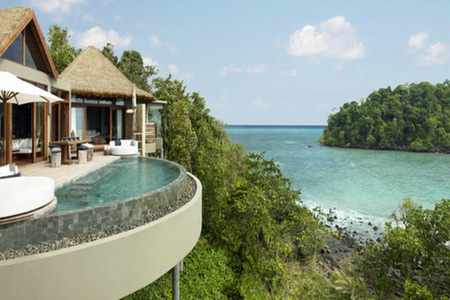 There are 27 one and two-bedroom villas; some of which are perched over the sea with steps into the water and others are tucked in above the jungle canopy on stilts enabling wonderful sea views. 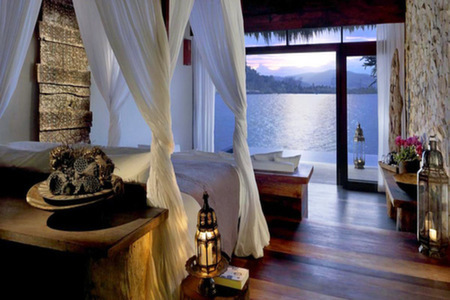 All are immaculate, with a similar natural decor, over-sized sunken bath tubs and private decks with plunge pools. 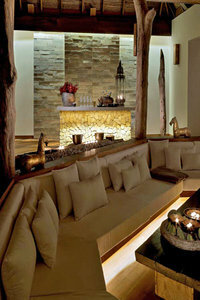 Expect gleaming wooden floors, four-poster beds that are illuminated by fairy lights underneath and smart white daybeds. The en-suites have double sinks and you may find yourself having unnecessary showers just to spend more time in them. 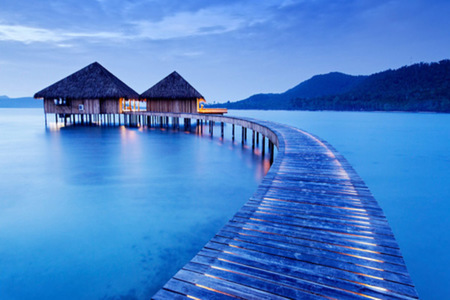 The stilted Overwater Villas have direct access to the ocean and a glass floor in the living room where you can watch fish swimming below your feet. The Ocean View Villas are on the shoreline and have a small patch of private beach, while the Jungle Villas which are further up the hill on the island have tremendous views out to the ocean. The resort has five two-bedroom villas ideal for families or small groups of friends. These have two large bedrooms off a huge living area with a kitchen area concealed by moving walls. Upgrade to one of these villas and you may find Mojita making instructions and ingredients on the woe surface. All villas have free minibars, stocked with wine, beer and an array of soft drinks and homemade daily snacks. That is just the beginning of the food and drink experience on the island. The leather bound room service menu provides a mouth-watering insight into the type of food available at the resort, which is included in the room rate. The resort has two fantastic restaurants. The Vista Restaurant and Lounge sits on stilts above the ocean and boasts a fabulous fine dining menu that makes the very best of the island?s natural ingredients and abundance of fresh fish. The food is exquisite and the setting is beautifully romantic. Tables can also be set up at various secluded locations on the island. Those seeking something a little more informal can head to the beachside Driftwood Bar, ideal for a pizza and a cold beer. The bar has a fabulous range of cocktails (also included in the room rate) and huge comfy bean bags that offer tremendous views of the sunset. There is no better way to end a day. The resort has a gorgeous fitness centre with huge floor-to-ceiling windows offering great views, and it has a beautiful spa, as well as a large infinity pool. While the accommodation and facilities are on one island, the second island (connected by a bridge) is largely untouched jungle, so great for exploring. Guests can get involved in many different activities with everything from cookery courses, kayaking, diving and snorkelling, to fishing trips and trips to the nearby island of Koh Rong to meet local people and see the work of the Song Saa charitable foundation. 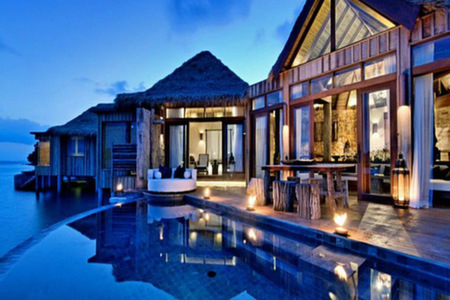 Song Saa Private Island has a simple ‘one price, per villa’ pricing policy. 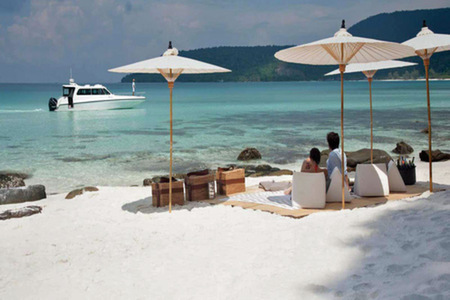 This means once guests step foot on Song Saa Private Island, they are free to indulge in everything the resort and its surrounds have to offer, knowing that all the resort’s features are included in the price. The only exceptions to this are motorised water sports, treatments at the resort’s spa, and some off-island excursions.